When you first dive into the world of development, everything you need to learn to get up to speed can be completely overwhelming. So we decided to take some of the guesswork out of the process. We've put together 10 of our favorite developer courses into one bundle - and we dropped the price to just $49 for all 10. Grab them all at Escapist Deals. We've got you covered no matter what you want to learn, with courses in Ruby on Rails, Python, Java, HTML5, CSS3, Angular 2, Xamarin, Objective-C, SQL, and more. Learn how to power the backend of a website with C#, create and execute your first Java program, get familiar with Python syntax, create apps like a magnet detector and music player, and learn how to create mobile apps that work with any device and screen size. You'll even learn how to make money off of some of your projects, with lessons in incorporating ad revenue and in-app purchases. Once you're done with the courses, you'll have a whole portfolio of work to show off to prospective employers. And the in-demand skills that companies like to see on a resume. 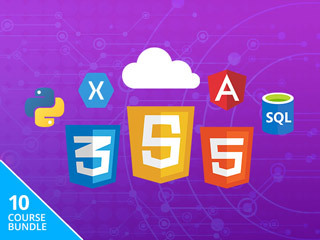 Get the Ultimate Learn to Code 2017 bundle for $49 at Escapist Deals.